The first plastic chair was designed in the 1950s, and really hasn’t changed too much since. Or, has it? We don’t think much of plastic chairs nowadays, but imagine a time when plastic was a novelty and owning something made out of it was considered an artistic statement. Weird, right? We just don’t think of those crusty old lawn chairs as being anything other than what they are – an affordable seating option that doesn’t have to be dragged indoors every time it rains. It wasn’t always like that, though. Back in the 1950s, plastic chairs were making a name for themselves. Of course, there were hundreds – if not thousands – of plastic chairs sitting around (pun intended) after polymers went into mass production in the 50s, but it was a Danish designer named Verner Panton who elevated a novelty to an art form. The first Panton chair was produced in 1965, and it was the first chair made from a single piece of molded plastic. Predecessors included the Eames’ 1948 shell design, which was arguably the first mass-produced plastic chair – but it included fiberglass and had metal legs. The Panton, on the other hand, was plastic only and it didn’t hurt its popularity that it looked like something straight out of the future. 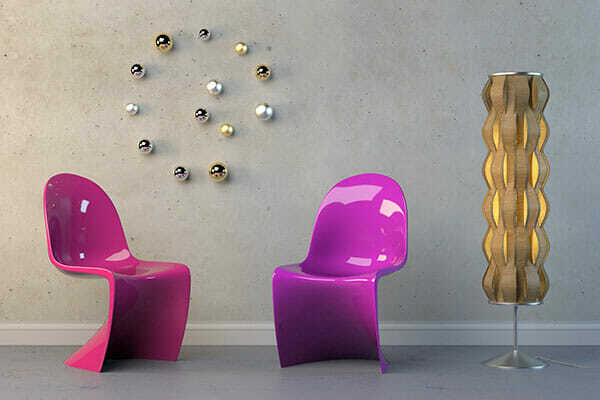 Imagine the purple Panton design pictured above sitting in your home in 1965. Amazingly, the style persists to this day, due in no small part to its historical significance. Ultimately, however, people appreciated it more for its form than its function and it never enjoyed the mainstream success of mass production. Despite the physical allure and stackable quality of the Panton, it was the Eames shell that would become the template for every cafeteria and classroom chair in America. The 1948 model, which was produced until 1968, sat alongside the Panton with regard to respect for its design, but it somehow managed to break through the barrier of the art world and enter into mass production. So, if the Eames shell was so popular, why did they stop making them? It’s a good question that’s probably best answered by the vagaries of the furniture market and the ebb and flow of consumer taste. But, it wouldn’t be the end of Eames – or of Panton. For whatever reason, “retro” style is on the rise and mid-century furniture design is alive and well in many mod corners of America. Some will argue it never died, but they might be the same people who never stopped wearing bell bottoms. To each their own, of course, and as (art) history has shown us – these are indeed revolutionary chair designs, and it’s hard to deny them another chance at greatness. James Madeiros is Lead Copy & Concept Design for ATGStores.com, an online home improvement retailer and Lowe’s subsidiary.